Just two ten-thousandths of a second separated six-time champ Jamie Whincup from young talent Scott McLaughlin in the final practice session at the Wilson Security Sandown 500. It was the final all-in session before the cars qualify, and the first run for the primary drivers since yesterday’s early practice. McLaughlin sat at the top of the times for plenty of the session before Whincup’s 1min.08.9245sec lap. 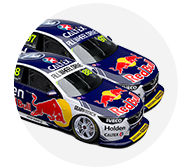 The Kiwi believes there is more time in his Volvo, while Whincup pointed out the difference in conditions at the Victorian circuit today. “There’s nothing in it, that’s what happens week in week out, you try and be on the right side of that call,” Whincup said of the close margin. Shane van Gisbergen came in third after co-driver Alex Premat completed a handful of laps in the session, and seemed to obstruct Garth Tander on a quick lap in his Holden Racing Team Commodore. Tander was speedy throughout the session and finished sixth with a smile on his face. 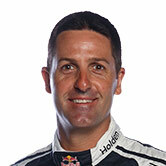 “It’s only practice it doesn’t matter too much,” he said of the close call with van Gisbergen. “We were up the front most of the session. “It’s encouraging going into qualifying, the car’s responding nicely, we rolled it out the truck yesterday and it was really good. Title front-runners Craig Lowndes was 12th while Dean Canto/Mark Winterbottom were 15th at the end of the session. Andre Heimgartner was a surprise addition to the top 10, finishing ninth. A red flag punctuated the session with a number of cars, including Nick Percat, dislodged a traffic cone out on track. James Moffat lost running time early on with brake pedal issues, and Todd Kelly's Nissan was stranded at the end of the session with the Nissan team reportedly completing an engine change before qualifying. The Supercars will run an all-in qualifying session before the two unique qualifying races to come at Sandown.